Fully integrated into the national capital region’s mass transportation network, there are a variety of convenient and accessible options for getting to and from Takoma Park. Takoma Park is a great place to ride a bike for your daily commute, running errands, or just for fun. Signed, on-street bike routes connect commercial districts, the Takoma Park Community Center, and transit facilities with regional multi-use trails. With access to the Sligo Creek Trail and Metropolitan Branch Trail, downtown Washington and nature are all easily within reach. Takoma Park is currently making a variety of bikeway improvements – improving bike routes, installing bike parking and bike repair stands, and working to expand bike sharing – to allow riders to easily and safely ride on the City’s streets. Need a bike? There are 7 Capital Bikeshare stations in Takoma Park connecting to those in nearby Silver Spring and Washington D.C. 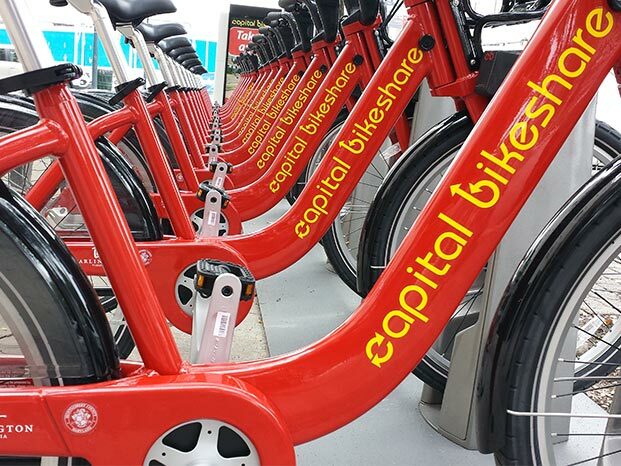 Pick up one of the iconic red bikes in the city and ride to any of Capital Bikeshare’s 370+ stations in the Metropolitan Washington area! The Takoma Langley Crossroads Transit Center, at New Hampshire Avenue and University Boulevard, accommodates up to 12,000 daily bus passengers on 11 different bus routes, providing passengers with a waiting area, restrooms, and bus information. Both Zipcar and Enterprise CarShare are located in and around Takoma Park. Car2Go is available in Washington D.C., but does not yet extend into Maryland. The Takoma Metrorail station is on Metro’s Red Line located in the nearby neighborhood of Takoma, D.C. and serves both Takoma Park and the Takoma, D.C., neighborhood. The Takoma station is a busy transfer point for WMATA and Ride-on busseswith connections to Silver Spring, Prince George’s Plaza, White Oak, and many other regional destinations and Metro stations. In addition to Metrorail, the station is serviced by 17 bus routes, Capital Bikeshare, and has 58 metered parking spots available for short-term parking. Takoma Park is conveniently located within two miles of the Capital Beltway (I-495) via New Hampshire Avenue (Rt. 650) or University Boulevard (Rt. 193). Parking information is available on the Parking Information page. Takoma Park is a walkable community rewarding pedestrians with a sensory experience that shows off the city’s history, cultural energy, and seasonal change. Accessibility is a City-wide priority; sidewalks are being built and upgraded for ADA-compliance. Details of ongoing infrastructure work, including sidewalk improvements, can be found on our Project Directory. Information on how to request a sidewalk can be found on the New Sidewalk Requests page. Printed copies are also available at the Takoma Park Community Center – Sam Abbott Citizens’ Center. Explore the cultural diversity and unique shopping opportunities of the New Hampshire Avenue corridor! The New Ave website has some great suggestions for walking tours on its Walk the New Ave page complete with maps. Getting around Takoma Park by bus is easy! 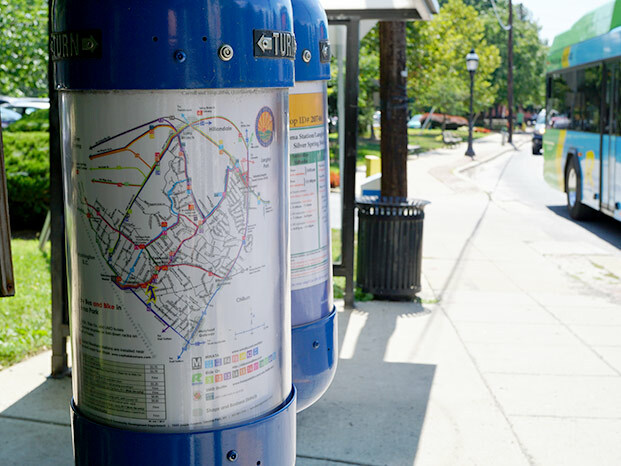 Takoma Park is served by multiple bus routes, making it easy to get around southern Montgomery County, western Prince George’s County, and the District of Columbia. Broken parking meter? 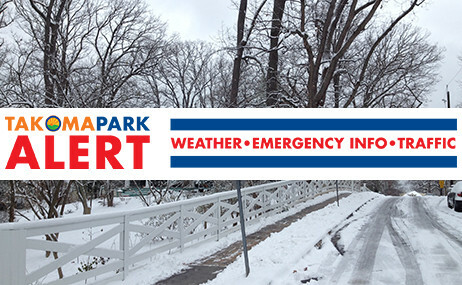 Email parking@takomaparkmd.gov, call 301-270-1100 or use the My TkPk app. 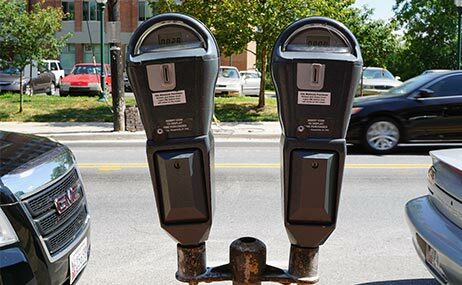 For more information on parking in Takoma Park visit the Parking Information page.